EMV chip on "smart cards"
A credit card is a small plastic card issued to users as a system of payment. It allows its holder to buy goods and services based on the holder's promise to pay for these goods and services. The issuer of the card creates a revolving account and grants a line of credit to the consumer (or the user) from which the user can borrow money for payment to a merchant or as a cash advance to the user. A credit card is different from a charge card: a charge card requires the balance to be paid in full each month. In contrast, credit cards allow the consumers a continuing balance of debt, subject to interest being charged. A credit card also differs from a cash card, which can be used like currency by the owner of the card. Most credit cards are issued by banks or credit unions, and are the shape and size specified by the ISO/IEC 7810 standard as ID-1. This is defined as 85.60 × 53.98 mm (3.370 × 2.125 in) (33/8 × 21/8 in) in size. The concept of using a card for purchases was described in 1887 by Edward Bellamy in his utopian novel Looking Backward. Bellamy used the term credit card eleven times in this novel. The modern credit card was the successor of a variety of merchant credit schemes. It was first used in the 1920s, in the United States, specifically to sell fuel to a growing number of automobile owners. In 1938 several companies started to accept each other's cards. Western Union had begun issuing charge cards to its frequent customers in 1921. Some charge cards were printed on paper card stock, but were easily counterfeited. The Charga-Plate, developed in 1928, was an early predecessor to the credit card and used in the U.S. from the 1930s to the late 1950s. It was a 2½" × 1¼" rectangle of sheet metal related to Addressograph and military dog tag systems. It was embossed with the customer's name, city and state. It held a small paper card for a signature. In recording a purchase, the plate was laid into a recess in the imprinter, with a paper "charge slip" positioned on top of it. The record of the transaction included an impression of the embossed information, made by the imprinter pressing an inked ribbon against the charge slip. Charga-Plate was a trademark of Farrington Manufacturing Co. Charga-Plates were issued by large-scale merchants to their regular customers, much like department store credit cards of today. In some cases, the plates were kept in the issuing store rather than held by customers. When an authorized user made a purchase, a clerk retrieved the plate from the store's files and then processed the purchase. Charga-Plates speeded back-office bookkeeping that was done manually in paper ledgers in each store, before computers. The concept of customers paying different merchants using the same card was implemented in 1950 by Ralph Schneider and Frank McNamara, founders of Diners Club, to consolidate multiple cards. The Diners Club, which was created partially through a merger with Dine and Sign, produced the first "general purpose" charge card, and required the entire bill to be paid with each statement. That was followed by Carte Blanche and in 1958 by American Express which created a worldwide credit card network (although these were initially charge cards that acquired credit card features after BankAmericard demonstrated the feasibility of the concept). However, until 1958, no one had been able to create a working revolving credit financial instrument issued by a third-party bank that was generally accepted by a large number of merchants (as opposed to merchant-issued revolving cards accepted by only a few merchants). A dozen experiments by small American banks had been attempted (and had failed). In September 1958, Bank of America launched the BankAmericard in Fresno, California. BankAmericard became the first successful recognizably modern credit card (although it underwent a troubled gestation during which its creator resigned), and with its overseas affiliates, eventually evolved into the Visa system. In 1966, the ancestor of MasterCard was born when a group of California banks established Master Charge to compete with BankAmericard; it received a significant boost when Citibank merged its proprietary Everything Card (launched in 1967) into Master Charge in 1969. Early credit cards in the U.S., of which BankAmericard was the most prominent example, were mass produced and mass mailed unsolicited to bank customers who were thought to be good credit risks. But, “They have been mailed off to unemployables, drunks, narcotics addicts and to compulsive debtors, a process President Johnson’s Special Assistant Betty Furness found very like ‘giving sugar to diabetics’.” These mass mailings were known as "drops" in banking terminology, and were outlawed in 1970 due to the financial chaos that they caused, but not before 100 million credit cards had been dropped into the U.S. population. After 1970, only credit card applications could be sent unsolicited in mass mailings. The fractured nature of the U.S. banking system under the Glass–Steagall Act meant that credit cards became an effective way for those who were traveling around the country to move their credit to places where they could not directly use their banking facilities. In 1966 Barclaycard in the UK launched the first credit card outside of the U.S. There are now countless variations on the basic concept of revolving credit for individuals (as issued by banks and honored by a network of financial institutions), including organization-branded credit cards, corporate-user credit cards, store cards and so on. Although credit cards reached very high adoption levels in the US, Canada and the UK in the mid twentieth century, many cultures were more cash-oriented, or developed alternative forms of cash-less payments, such as Carte bleue or the Eurocard (Germany, France, Switzerland, and others). In these places, adoption of credit cards was initially much slower. It took until the 1990s to reach anything like the percentage market-penetration levels achieved in the US, Canada, or UK. In some countries, acceptance still remains poor as the use of a credit card system depends on the banking system being perceived as reliable. Japan remains a very cash oriented society, with credit card adoption being limited to only the largest of merchants, although an alternative system based on RFIDs inside cellphones has seen some acceptance. Because of strict regulations regarding banking system overdrafts, some countries, France in particular, were much faster to develop and adopt chip-based credit cards which are now seen as major anti-fraud credit devices. Debit cards and online banking are used more widely than credit cards in some countries. The design of the credit card itself has become a major selling point in recent years. The value of the card to the issuer is often related to the customer's usage of the card, or to the customer's financial worth. This has led to the rise of Co-Brand and Affinity cards - where the card design is related to the "affinity" (a university or professional society, for example) leading to higher card usage. In most cases a percentage of the value of the card is returned to the affinity group. A growing field of numismatics (study of money), or more specifically exonumia (study of money-like objects), credit card collectors seek to collect various embodiments of credit from the now familiar plastic cards to older paper merchant cards, and even metal tokens that were accepted as merchant credit cards. Early credit cards were made of celluloid plastic, then metal and fiber, then paper, and are now mostly plastic. Credit cards are issued by a credit card issuer, such as a bank or credit union, after an account has been approved by the credit provider, after which cardholders can use it to make purchases at merchants accepting that card. Merchants often advertise which cards they accept by displaying acceptance marks – generally derived from logos – or may communicate this orally, as in "Credit cards are fine" (implicitly meaning "major brands"), "We take (brands X, Y, and Z)", or "We don't take credit cards". When a purchase is made, the credit card user agrees to pay the card issuer. The cardholder indicates consent to pay by signing a receipt with a record of the card details and indicating the amount to be paid or by entering a personal identification number (PIN). Also, many merchants now accept verbal authorizations via telephone and electronic authorization using the Internet, known as a card not present transaction (CNP). Electronic verification systems allow merchants to verify in a few seconds that the card is valid and the credit card customer has sufficient credit to cover the purchase, allowing the verification to happen at time of purchase. The verification is performed using a credit card payment terminal or point-of-sale (POS) system with a communications link to the merchant's acquiring bank. Data from the card is obtained from a magnetic stripe or chip on the card; the latter system is called Chip and PIN in the United Kingdom and Ireland, and is implemented as an EMV card. For card not present transactions where the card is not shown (e.g., e-commerce, mail order, and telephone sales), merchants additionally verify that the customer is in physical possession of the card and is the authorized user by asking for additional information such as the security code printed on the back of the card, date of expiry, and billing address. Each month, the credit card user is sent a statement indicating the purchases undertaken with the card, any outstanding fees, and the total amount owed. After receiving the statement, the cardholder may dispute any charges that he or she thinks are incorrect (see 15 U.S.C. § 1643, which limits cardholder liability for unauthorized use of a credit card to $50, and the Fair Credit Billing Act for details of the US regulations). Otherwise, the cardholder must pay a defined minimum proportion of the bill by a due date, or may choose to pay a higher amount up to the entire amount owed. The credit issuer charges interest on the amount owed if the balance is not paid in full (typically at a much higher rate than most other forms of debt). In addition, if the credit card user fails to make at least the minimum payment by the due date, the issuer may impose a "late fee" and/or other penalties on the user. To help mitigate this, some financial institutions can arrange for automatic payments to be deducted from the user's bank accounts, thus avoiding such penalties altogether as long as the cardholder has sufficient funds. Credit card advertising regulations include the Schumer box disclosure requirements. A large fraction of junk mail consists of credit card offers created from lists provided by the major credit reporting agencies. In the United States, the three major US credit bureaus (Equifax, TransUnion and Experian) allow consumers to opt out from related credit card solicitation offers via its Opt Out Pre Screen program. Credit card issuers usually waive interest charges if the balance is paid in full each month, but typically will charge full interest on the entire outstanding balance from the date of each purchase if the total balance is not paid. For example, if a user had a $1,000 transaction and repaid it in full within this grace period, there would be no interest charged. If, however, even $1.00 of the total amount remained unpaid, interest would be charged on the $1,000 from the date of purchase until the payment is received. The precise manner in which interest is charged is usually detailed in a cardholder agreement which may be summarized on the back of the monthly statement. The general calculation formula most financial institutions use to determine the amount of interest to be charged is APR/100 x ADB/365 x number of days revolved. Take the annual percentage rate (APR) and divide by 100 then multiply to the amount of the average daily balance (ADB) divided by 365 and then take this total and multiply by the total number of days the amount revolved before payment was made on the account. Financial institutions refer to interest charged back to the original time of the transaction and up to the time a payment was made, if not in full, as RRFC or residual retail finance charge. Thus after an amount has revolved and a payment has been made, the user of the card will still receive interest charges on their statement after paying the next statement in full (in fact the statement may only have a charge for interest that collected up until the date the full balance was paid, i.e. when the balance stopped revolving). The credit card may simply serve as a form of revolving credit, or it may become a complicated financial instrument with multiple balance segments each at a different interest rate, possibly with a single umbrella credit limit, or with separate credit limits applicable to the various balance segments. Usually this compartmentalization is the result of special incentive offers from the issuing bank, to encourage balance transfers from cards of other issuers. In the event that several interest rates apply to various balance segments, payment allocation is generally at the discretion of the issuing bank, and payments will therefore usually be allocated towards the lowest rate balances until paid in full before any money is paid towards higher rate balances. Interest rates can vary considerably from card to card, and the interest rate on a particular card may jump dramatically if the card user is late with a payment on that card or any other credit instrument, or even if the issuing bank decides to raise its revenue. The main benefit to each customer is convenience. Compared to debit cards and cheques, a credit card allows small short-term loans to be quickly made to a customer who need not calculate a balance remaining before every transaction, provided the total charges do not exceed the maximum credit line for the card. Credit cards also provide more fraud protection than debit cards. In the UK for example, the bank is jointly liable with the merchant for purchases of defective products over £100. Many credit cards offer rewards and benefits packages, such as offering enhanced product warranties at no cost, free loss/damage coverage on new purchases, and points which may be redeemed for cash, products, or airline tickets. Additionally, carrying a credit card may be a convenience to some customers as it eliminates the need to carry any cash for most purposes. Low introductory credit card rates are limited to a fixed term, usually between 6 and 12 months, after which a higher rate is charged. As all credit cards charge fees and interest, some customers become so indebted to their credit card provider that they are driven to bankruptcy. Some credit cards often levy a rate of 20 to 30 percent after a payment is missed; in other cases a fixed charge is levied without change to the interest rate. In some cases universal default may apply: the high default rate is applied to a card in good standing by missing a payment on an unrelated account from the same provider. This can lead to a snowball effect in which the consumer is drowned by unexpectedly high interest rates. Further, most card holder agreements enable the issuer to arbitrarily raise the interest rate for any reason they see fit. As of December 2009, First Premier Bank is reportedly offering a credit card with a 79.9% interest rate. Merchants that accept credit cards must pay interchange fees and discount fees on all credit-card transactions. In some cases merchants are barred by their credit agreements from passing these fees directly to credit card customers, or from setting a minimum transaction amount (no longer prohibited in the United States). The result is that merchants may charge all customers (including those who do not use credit cards) higher prices to cover the fees on credit card transactions. In the United States in 2008 credit card companies collected a total of $48 billion in interchange fees, or an average of $427 per family, with an average fee rate of about 2% per transaction. A credit card's grace period is the time the customer has to pay the balance before interest is assessed on the outstanding balance. Grace periods may vary, but usually range from 20 to 50 days depending on the type of credit card and the issuing bank. Some policies allow for reinstatement after certain conditions are met. Usually, if a customer is late paying the balance, finance charges will be calculated and the grace period does not apply. Finance charges incurred depend on the grace period and balance; with most credit cards there is no grace period if there is any outstanding balance from the previous billing cycle or statement (i.e. interest is applied on both the previous balance and new transactions). However, there are some credit cards that will only apply finance charge on the previous or old balance, excluding new transactions. For merchants, a credit card transaction is often more secure than other forms of payment, such as cheques, because the issuing bank commits to pay the merchant the moment the transaction is authorized, regardless of whether the consumer defaults on the credit card payment (except for legitimate disputes, which are discussed below, and can result in charges back to the merchant). In most cases, cards are even more secure than cash, because they discourage theft by the merchant's employees and reduce the amount of cash on the premises. Prior to credit cards, each merchant had to evaluate each customer's credit history before extending credit. That task is now performed by the banks which assume the credit risk. Credit cards can also aid in securing a sale, especially if the customer does not have enough cash on his or her person or checking account. Extra turnover is generated by the fact that the customer can purchase goods and/or services immediately and is less inhibited by the amount of cash in his or her pocket and the immediate state of his or her bank balance. Much of merchants' marketing is based on this immediacy. For each purchase, the bank charges the merchant a commission (discount fee) for this service and there may be a certain delay before the agreed payment is received by the merchant. The commission is often a percentage of the transaction amount, plus a fixed fee (interchange rate). In addition, a merchant may be penalized or have their ability to receive payment using that credit card restricted if there are too many cancellations or reversals of charges as a result of disputes. Some small merchants require credit purchases to have a minimum amount to compensate for the transaction costs. In some countries, for example the Nordic countries, banks guarantee payment on stolen cards only if an ID card is checked and the ID card number/civic registration number is written down on the receipt together with the signature. In these countries merchants therefore usually ask for ID. Non-Nordic citizens, who are unlikely to possess a Nordic ID card or driving license, will instead have to show their passport, and the passport number will be written down on the receipt, sometimes together with other information. Some shops use the card's PIN for identification, and in that case showing an ID card is not necessary. Merchants are charged several fees for the privilege of accepting credit cards. The merchant is usually charged a commission of around 1 to 3 per-cent of the value of each transaction paid for by credit card. The merchant may also pay a variable charge, called an interchange rate, for each transaction. In some instances of very low-value transactions, use of credit cards will significantly reduce the profit margin or cause the merchant to lose money on the transaction. Merchants must accept these transactions as part of their costs to retain the right to accept credit card transactions. Merchants with very low average transaction prices or very high average transaction prices are more averse to accepting credit cards. In some cases merchants may charge users a "credit card supplement", either a fixed amount or a percentage, for payment by credit card. 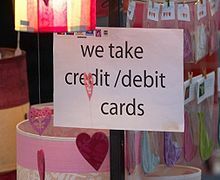 This practice is prohibited by the credit card contracts in the United States, although the contracts allow the merchants to give discounts for cash payment. Card-issuing bank: The financial institution or other organization that issued the credit card to the cardholder. This bank bills the consumer for repayment and bears the risk that the card is used fraudulently. American Express and Discover were previously the only card-issuing banks for their respective brands, but as of 2007, this is no longer the case. Cards issued by banks to cardholders in a different country are known as offshore credit cards. Merchant account: This could refer to the acquiring bank or the independent sales organization, but in general is the organization that the merchant deals with. Credit Card association: An association of card-issuing banks such as Visa, MasterCard, Discover, American Express, etc. that set transaction terms for merchants, card-issuing banks, and acquiring banks. Affinity partner: Some institutions lend their names to an issuer to attract customers that have a strong relationship with that institution, and get paid a fee or a percentage of the balance for each card issued using their name. Examples of typical affinity partners are sports teams, universities, charities, professional organizations, and major retailers. The flow of information and money between these parties — always through the card associations — is known as the interchange, and it consists of a few steps. Authorization: The cardholder pays for the purchase and the merchant submits the transaction to the acquirer (acquiring bank). The acquirer verifies the credit card number, the transaction type and the amount with the issuer (Card-issuing bank) and reserves that amount of the cardholder's credit limit for the merchant. An authorization will generate an approval code, which the merchant stores with the transaction. Clearing and Settlement: The acquirer sends the batch transactions through the credit card association, which debits the issuers for payment and credits the acquirer. Essentially, the issuer pays the acquirer for the transaction. Funding: Once the acquirer has been paid, the acquirer pays the merchant. The merchant receives the amount totaling the funds in the batch minus either the "discount rate," "mid-qualified rate", or "non-qualified rate" which are tiers of fees the merchant pays the acquirer for processing the transactions. Chargebacks: A chargeback is an event in which money in a merchant account is held due to a dispute relating to the transaction. Chargebacks are typically initiated by the cardholder. In the event of a chargeback, the issuer returns the transaction to the acquirer for resolution. The acquirer then forwards the chargeback to the merchant, who must either accept the chargeback or contest it. A secured credit card is a type of credit card secured by a deposit account owned by the cardholder. Typically, the cardholder must deposit between 100% and 200% of the total amount of credit desired. Thus if the cardholder puts down $1000, they will be given credit in the range of $500–$1000. In some cases, credit card issuers will offer incentives even on their secured card portfolios. In these cases, the deposit required may be significantly less than the required credit limit, and can be as low as 10% of the desired credit limit. This deposit is held in a special savings account. Credit card issuers offer this because they have noticed that delinquencies were notably reduced when the customer perceives something to lose if the balance is not repaid. The cardholder of a secured credit card is still expected to make regular payments, as with a regular credit card, but should they default on a payment, the card issuer has the option of recovering the cost of the purchases paid to the merchants out of the deposit. The advantage of the secured card for an individual with negative or no credit history is that most companies report regularly to the major credit bureaus. This allows for building of positive credit history. Although the deposit is in the hands of the credit card issuer as security in the event of default by the consumer, the deposit will not be debited simply for missing one or two payments. Usually the deposit is only used as an offset when the account is closed, either at the request of the customer or due to severe delinquency (150 to 180 days). This means that an account which is less than 150 days delinquent will continue to accrue interest and fees, and could result in a balance which is much higher than the actual credit limit on the card. In these cases the total debt may far exceed the original deposit and the cardholder not only forfeits their deposit but is left with an additional debt. Most of these conditions are usually described in a cardholder agreement which the cardholder signs when their account is opened. Secured credit cards are an option to allow a person with a poor credit history or no credit history to have a credit card which might not otherwise be available. They are often offered as a means of rebuilding one's credit. Fees and service charges for secured credit cards often exceed those charged for ordinary non-secured credit cards, however, for people in certain situations, (for example, after charging off on other credit cards, or people with a long history of delinquency on various forms of debt), secured cards are almost always more expensive then unsecured credit cards. Sometimes a credit card will be secured by the equity in the borrower's home. A prepaid credit card is not a true credit card, since no credit is offered by the card issuer: the card-holder spends money which has been "stored" via a prior deposit by the card-holder or someone else, such as a parent or employer. However, it carries a credit-card brand (such as Visa, MasterCard, American Express, Discover, or JCB) and can be used in similar ways just as though it were a regular credit card. Unlike debit cards, prepaid credit cards generally do not require a PIN. An exception are prepaid credit cards with an EMV chip. These cards do require a PIN if the payment is processed via Chip and PIN technology. After purchasing the card, the cardholder loads the account with any amount of money, up to the predetermined card limit and then uses the card to make purchases the same way as a typical credit card. Prepaid cards can be issued to minors (above 13) since there is no credit line involved. The main advantage over secured credit cards (see above section) is that you are not required to come up with $500 or more to open an account. With prepaid credit cards purchasers not charged any interest but are often charged a purchasing fee plus monthly fees after an arbitrary time period. Many other fees also usually apply to a prepaid card. Prepaid credit cards are sometimes marketed to teenagers for shopping online without having their parents complete the transaction. Because of the many fees that apply to obtaining and using credit-card-branded prepaid cards, the Financial Consumer Agency of Canada describes them as "an expensive way to spend your own money". The agency publishes a booklet entitled Pre-paid Cards which explains the advantages and disadvantages of this type of prepaid card. As well as convenient, accessible credit, credit cards offer consumers an easy way to track expenses, which is necessary for both monitoring personal expenditures and the tracking of work-related expenses for taxation and reimbursement purposes. Credit cards are accepted worldwide, and are available with a large variety of credit limits, repayment arrangement, and other perks (such as rewards schemes in which points earned by purchasing goods with the card can be redeemed for further goods and services or credit card cashback). Some countries, such as the United States, the United Kingdom, and France, limit the amount for which a consumer can be held liable due to fraudulent transactions as a result of a consumer's credit card being lost or stolen. Credit card security relies on the physical security of the plastic card as well as the privacy of the credit card number. Therefore, whenever a person other than the card owner has access to the card or its number, security is potentially compromised. Once, merchants would often accept credit card numbers without additional verification for mail order purchases. It's now common practice to only ship to confirmed addresses as a security measure to minimise fraudulent purchases. Some merchants will accept a credit card number for in-store purchases, whereupon access to the number allows easy fraud, but many require the card itself to be present, and require a signature. A lost or stolen card can be cancelled, and if this is done quickly, will greatly limit the fraud that can take place in this way. European banks can require a cardholder's security PIN be entered for in-person purchases with the card. The PCI DSS is the security standard issued by The PCI SSC (Payment Card Industry Security Standards Council). This data security standard is used by acquiring banks to impose cardholder data security measures upon their merchants. A smart card, combining credit card and debit card properties. The 3 by 5 mm security chip embedded in the card is shown enlarged in the inset. The contact pads on the card enable electronic access to the chip. The goal of the credit card companies is not to eliminate fraud, but to "reduce it to manageable levels". This implies that high-cost low-return fraud prevention measures will not be used if their cost exceeds the potential gains from fraud reduction - as would be expected from organisations whose goal is profit maximisation. Internet fraud may be by claiming a chargeback which is not justified ("friendly fraud"), or carried out by the use of credit card information which can be stolen in many ways, the simplest being copying information from retailers, either online or offline. Despite efforts to improve security for remote purchases using credit cards, security breaches are usually the result of poor practice by merchants. For example, a website that safely uses SSL to encrypt card data from a client may then email the data, unencrypted, from the webserver to the merchant; or the merchant may store unencrypted details in a way that allows them to be accessed over the Internet or by a rogue employee; unencrypted card details are always a security risk. Even encryption data may be cracked. Controlled Payment Numbers which are used by various banks such as Citibank (Virtual Account Numbers), Discover (Secure Online Account Numbers, Bank of America (Shop Safe), 5 banks using eCarte Bleue and CMB's Virtualis in France, and Swedbank of Sweden's eKort product are another option for protecting against credit card fraud. These are generally one-time use numbers that front one's actual account (debit/credit) number, and are generated as one shops on-line. They can be valid for a relatively short time, for the actual amount of the purchase, or for a price limit set by the user. Their use can be limited to one merchant. If the number given to the merchant is compromised, it will be rejected if an attempt is made to use it again. A similar system of controls can be used on physical cards. 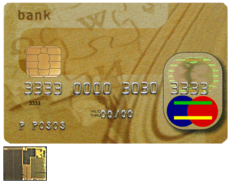 Technology provides the option for banks to support many other controls too that can be turned on and off and varied by the credit card owner in real time as circumstances change (i.e., they can change temporal, numerical, geographical and many other parameters on their primary and subsidiary cards). Apart from the obvious benefits of such controls: from a security perspective this means that a customer can have a Chip and PIN card secured for the real world, and limited for use in the home country. In this eventuality a thief stealing the details will be prevented from using these overseas in non chip and pin (EMV) countries. Similarly the real card can be restricted from use on-line so that stolen details will be declined if this tried. Then when card users shop online they can use virtual account numbers. In both circumstances an alert system can be built in notifying a user that a fraudulent attempt has been made which breaches their parameters, and can provide data on this in real time. This is the optimal method of security for credit cards, as it provides very high levels of security, control and awareness in the real and virtual world. Additionally, there are security features present on the physical card itself in order to prevent counterfeiting. For example, most modern credit cards have a watermark that will fluoresce under ultraviolet light. A Visa card has a letter V superimposed over the regular Visa logo and a Mastercard has the letters MC across the front of the card. Older Visa cards have a bald eagle or dove across the front. In the aforementioned cases, the security features are only visible under ultraviolet light and are invisible in normal light. The Federal Bureau of Investigation and U.S. Postal Inspection Service are responsible for prosecuting criminals who engage in credit card fraud in the United States, but they do not have the resources to pursue all criminals. In general, federal officials only prosecute cases exceeding US$5,000. Three improvements to card security have been introduced to the more common credit card networks but none has proven to help reduce credit card fraud so far. First, the on-line verification system used by merchants is being enhanced to require a 4 digit Personal Identification Number (PIN) known only to the card holder. Second, the cards themselves are being replaced with similar-looking tamper-resistant smart cards which are intended to make forgery more difficult. The majority of smart card (IC card) based credit cards comply with the EMV (Europay MasterCard Visa) standard. Third, an additional 3 or 4 digit Card Security Code (CSC) is now present on the back of most cards, for use in card not present transactions. Stakeholders at all levels in electronic payment have recognized the need to develop consistent global standards for security that account for and integrate both current and emerging security technologies. They have begun to address these needs through organizations such as PCI DSS and the Secure POS Vendor Alliance. Code 10 calls are made when merchants are suspicious about accepting a credit card. The operator then asks the merchant a series of YES or NO questions to find out whether the merchant is suspicious of the card or the cardholder. The merchant may be asked to retain the card if it is safe to do so. The way credit card owners pay off their balances has a tremendous effect on their credit history. Two of the most important factors reported to a credit bureau are the timeliness of the debt payments and the amount of debt to credit limit. Lenders want to see payments made as agreed, usually on a monthly basis, and a credit balance of around one-third the credit limit. The credit information stays on the credit report generally for 7 years. However, there are a few jurisdictions and situations where the timeframe might differ. In recent times, credit card portfolios have been very profitable for banks, largely due to the booming economy of the late nineties. However, in the case of credit cards, such high returns go hand in hand with risk, since the business is essentially one of making unsecured (uncollateralized) loans, and thus dependent on borrowers not to default in large numbers. Banks generally borrow the money they then lend to their customers. As they receive very low-interest loans from other firms, they may borrow as much as their customers require, while lending their capital to other borrowers at higher rates. If the card issuer charges 15% on money lent to users, and it costs 5% to borrow the money to lend, and the balance sits with the cardholder for a year, the issuer earns 10% on the loan. This 10% difference is the "net interest spread" and the 5% is the "interest expense". This is the cost of running the credit card portfolio, including everything from paying the executives who run the company to printing the plastics, to mailing the statements, to running the computers that keep track of every cardholder's balance, to taking the many phone calls which cardholders place to their issuer, to protecting the customers from fraud rings. Depending on the issuer, marketing programs are also a significant portion of expenses. A charge-off is considered to be "written off as uncollectable." To banks, bad debts and even fraud are simply part of the cost of doing business. However, the debt is still legally valid, and the creditor can attempt to collect the full amount for the time periods permitted under state law, which is usually 3 to 7 years. This includes contacts from internal collections staff, or more likely, an outside collection agency. If the amount is large (generally over $1500–$2000), there is the possibility of a lawsuit or arbitration. Many credit card customers receive rewards, such as frequent flyer points, gift certificates, or cash back as an incentive to use the card. Rewards are generally tied to purchasing an item or service on the card, which may or may not include balance transfers, cash advances, or other special uses. Depending on the type of card, rewards will generally cost the issuer between 0.25% and 2.0% of the spread. Networks such as Visa or MasterCard have increased their fees to allow issuers to fund their rewards system. Some issuers discourage redemption by forcing the cardholder to call customer service for rewards. On their servicing website, redeeming awards is usually a feature that is very well hidden by the issuers. With a fractured and competitive environment, rewards points cut dramatically into an issuer's bottom line, and rewards points and related incentives must be carefully managed to ensure a profitable portfolio. Unlike unused gift cards, in whose case the breakage in certain US states goes to the state's treasury, unredeemed credit card points are retained by the issuer. In relative numbers the values lost in bank card fraud are minor, calculated in 2006 at 7 cents per 100 dollars worth of transactions (7 basis points). In 2004, in the UK, the cost of fraud was over £500 million. When a card is stolen, or an unauthorized duplicate made, most card issuers will refund some or all of the charges that the customer has received for things they did not buy. These refunds will, in some cases, be at the expense of the merchant, especially in mail order cases where the merchant cannot claim sight of the card. In several countries, merchants will lose the money if no ID card was asked for, therefore merchants usually require ID card in these countries. Credit card companies generally guarantee the merchant will be paid on legitimate transactions regardless of whether the consumer pays their credit card bill. Most banking services have their own credit card services that handle fraud cases and monitor for any possible attempt at fraud. Employees that are specialized in doing fraud monitoring and investigation are often placed in Risk Management, Fraud and Authorization, or Cards and Unsecured Business. Fraud monitoring emphasizes minimizing fraud losses while making an attempt to track down those responsible and contain the situation. Credit card fraud is a major white collar crime that has been around for many decades, even with the advent of the chip based card (EMV) that was put into practice in some countries to prevent cases such as these. Even with the implementation of such measures, credit card fraud continues to be a problem. Promotional purchase is any purchase on which separate terms and conditions are set on each individual transaction unlike a standard purchase where the terms are set on the cardholder’s account record and their pricing strategy. All promotional purchases that post to a particular account will be carrying its own balance called as Promotional Balance. In addition to fees paid by the card holder, merchants must also pay interchange fees to the card-issuing bank and the card association. For a typical credit card issuer, interchange fee revenues may represent about a quarter of total revenues. These fees are typically from 1 to 6 percent of each sale, but will vary not only from merchant to merchant (large merchants can negotiate lower rates), but also from card to card, with business cards and rewards cards generally costing the merchants more to process. The interchange fee that applies to a particular transaction is also affected by many other variables including: the type of merchant, the merchant's total card sales volume, the merchant's average transaction amount, whether the cards were physically present, how the information required for the transaction was received, the specific type of card, when the transaction was settled, and the authorized and settled transaction amounts. In some cases, merchants add a surcharge to the credit cards to cover the interchange fee, encouraging their customers to instead use cash, debit cards, or even cheques. Interest charges vary widely from card issuer to card issuer. Often, there are "teaser" rates in effect for initial periods of time (as low as zero percent for, say, six months), whereas regular rates can be as high as 40 percent. In the U.S. there is no federal limit on the interest or late fees credit card issuers can charge; the interest rates are set by the states, with some states such as South Dakota, having no ceiling on interest rates and fees, inviting some banks to establish their credit card operations there. Other states, for example Delaware, have very weak usury laws. The teaser rate no longer applies if the customer doesn't pay their bills on time, and is replaced by a penalty interest rate (for example, 23.99%) that applies retroactively. Transactions in a foreign currency (as much as 3% of the amount). A few financial institutions do not charge a fee for this. Membership fees (annual or monthly), sometimes a percentage of the credit limit. Exchange rate loading fees (sometimes these might not be reported on the customer's statement, even when applied). The variation of exchange rates applied by different credit cards can be very substantial, as much as 10% according to a Lonely Planet report in 2009. Consumers who keep their account in good order by always staying within their credit limit, and always making at least the minimum monthly payment will see interest as the biggest expense from their card provider. Those who are not so careful and regularly surpass their credit limit or are late in making payments are exposed to multiple charges that were typically as high as £25 - £35  until a ruling from the Office of Fair Trading that they would presume charges over £12 to be unfair which led the majority of card providers to reduce their fees to exactly that level. The Credit CARD Protection Act of 2009, initiated during the term of President G W Bush, and signed into law by President Obama, requires that consumers "opt-in" to over-limit charges. Some card issuers have therefore commenced solicitations requesting customers to opt in to overlimit fees, presenting this as a benefit as it may avoid the possibility of a future transaction being declined. Other issuers have simply discontinued the practice of charging overlimit fees. Whether a customer opts in to the overlimit fee or not, banks will in practice have discretion as to whether they choose to authorize transactions above the credit limit or not. Of course, any approved over limit transactions will only result in an overlimit fee for those customers who have opted in to the fee. This legislation took effect on February 22, 2010. The higher level of fees originally charged were claimed to be designed to recoup the costs of the card operator's overall business and to ensure that the credit card business as a whole generated a profit, rather than simply recovering the cost to the provider of the limit breach which has been estimated as typically between £3-£4. Profiting from a customer's mistakes is arguably not permitted under UK common law, if the charges constitute penalties for breach of contract, or under the Unfair Terms In Consumer Regulations 1999. Subsequent rulings in respect of personal current accounts suggest that the argument that these charges are penalties for breach of contract is weak, and given the OFT's ruling it seems unlikely that any further test case will take place. Whilst the law remains in the balance, many consumers have made claims against their credit cards providers for the charges that they have incurred, plus interest that they would have earned had the money not been deducted from their account. It is likely that claims for amounts charged in excess of £12 will succeed, but claims for charges at the OFT's £12 threshold level are more contentious. The Government of Canada maintains a database of the fees, features, interest rates and reward programs of nearly 200 credit cards available in Canada. This database is updated on a quarterly basis with information supplied by the credit card issuing companies. Information in the database is published every quarter on the website of the Financial Consumer Agency of Canada (FCAC). Information in the database is published in two formats. It is available in PDF comparison tables that break down the information according to type of credit card, allowing the reader to compare the features of, for example, all the student credit cards in the database. The database also feeds into an interactive tool on the FCAC website. The interactive tool uses several interview-type questions to build a profile of the user's credit card usage habits and needs, eliminating unsuitable choices based on the profile, so that the user is presented with a small number of credit cards and the ability to carry out detailed comparisons of features, reward programs, interest rates, etc. Credit card debt has increased steadily. Since the late 1990s, lawmakers, consumer advocacy groups, college officials and other higher education affiliates have become increasingly concerned about the rising use of credit cards among college students. The major credit card companies have been accused of targeting a younger audience, in particular college students, many of whom are already in debt with college tuition fees and college loans and who typically are less experienced at managing their own finances. Credit card debt may also negatively affect their grades as they are likely to work more both part and full time positions. Another controversial area is the universal default feature of many North American credit card contracts. When a cardholder is late paying a particular credit card issuer, that card's interest rate can be raised, often considerably. With universal default, a customer's other credit cards, for which the customer may be current on payments, may also have their rates and/or credit limit changed. The universal default feature allows creditors to periodically check cardholders' credit portfolios to view trade, allowing these other institutions to decrease the credit limit and/or increase rates on cardholders who may be late with another credit card issuer. Being late on one credit card will potentially affect all the cardholder's credit cards. Citibank voluntarily stopped this practice in March 2007 and Chase stopped the practice in November 2007. The fact that credit card companies can change the interest rate on debts that were incurred when a different rate of interest was in place is similar to adjustable rate mortgages where interest rates on current debt may rise. However, in both cases this is agreed to in advance, and is a trade off that allows a lower initial rate as well as the possibility of an even lower rate (mortgages, if interest rates fall) or perpetually keeping a below-market rate (credit cards, if the user makes their debt payments on time). It should be noted that the Universal Default practice was actually encouraged by Federal Regulators, particularly those at the Office of the Comptroller of the Currency (OCC) as a means of managing the changing risk profiles of cardholders. Another controversial area is the trailing interest issue. Trailing interest is the practice of charging interest on the entire bill no matter what percentage of it is paid. U.S Senator Carl Levin raised the issue of millions of Americans affected by hidden fees, compounding interest and cryptic terms. Their woes were heard in a Senate Permanent Subcommittee on Investigations hearing which was chaired by Senator Levin, who said that he intends to keep the spotlight on credit card companies and that legislative action may be necessary to purge the industry. In 2009, the C.A.R.D. Act was signed into law, enacting protections for many of the issues Levin had raised. In the United States, some have called for Congress to enact additional regulations on the industry; to expand the disclosure box clearly disclosing rate hikes, use plain language, incorporate balance payoff disclosures, and also to outlaw universal default. At a congress hearing around March 1, 2007, Citibank announced it would no longer practice this, effective immediately. Opponents of such regulation argue that customers must become more proactive and self-responsible in evaluating and negotiating terms with credit providers. Some of the nation's influential top credit card issuers, who are among the top fifty corporate contributors to political campaigns, successfully opposed it. In the United Kingdom, merchants won the right through The Credit Cards (Price Discrimination) Order 1990 to charge customers different prices according to the payment method. As of 2007, the United Kingdom was one of the world's most credit-card-intensive countries, with 2.4 credit cards per consumer, according to the UK Payments Administration Ltd. In the United States, until 1984 federal law prohibited surcharges on card transactions. Although the federal Truth in Lending Act provisions that prohibited surcharges expired that year, a number of states have since enacted laws that continue to outlaw the practice; California, Colorado, Connecticut, Florida, Kansas, Massachusetts, Maine, New York, Oklahoma, and Texas have laws against surcharges. As of 2006, the United States probably had one of the world's highest if not the top ratio of credit cards per capita, with 984 million bank-issued Visa and MasterCard credit card and debit card accounts alone for an adult population of roughly 220 million people. The credit card per US capita ratio was nearly 4:1 as of 2003 and as high as 5:1 as of 2006. The numbers found on credit cards have a certain amount of internal structure, and share a common numbering scheme. The card number's prefix, called the Bank Identification Number, is the sequence of digits at the beginning of the number that determine the bank to which a credit card number belongs. This is the first six digits for MasterCard and Visa cards. The next nine digits are the individual account number, and the final digit is a validity check code. In addition to the main credit card number, credit cards also carry issue and expiration dates (given to the nearest month), as well as extra codes such as issue numbers and security codes. Not all credit cards have the same sets of extra codes nor do they use the same number of digits. Many credit cards can also be used in an ATM to withdraw money against the credit limit extended to the card, but many card issuers charge interest on cash advances before they do so on purchases. The interest on cash advances is commonly charged from the date the withdrawal is made, rather than the monthly billing date. Many card issuers levy a commission for cash withdrawals, even if the ATM belongs to the same bank as the card issuer. Merchants do not offer cashback on credit card transactions because they would pay a percentage commission of the additional cash amount to their bank or merchant services provider, thereby making it uneconomical. Many credit card companies will also, when applying payments to a card, do so at the end of a billing cycle, and apply those payments to everything before cash advances. For this reason, many consumers have large cash balances, which have no grace period and incur interest at a rate that is (usually) higher than the purchase rate, and will carry those balance for years, even if they pay off their statement balance each month. Credit cards are a risky way for entrepreneurs to acquire capital for their start ups when more conventional financing is unavailable. It's widely reported that Len Bosack and Sandy Lerner used personal credit cards to start Cisco Systems. It is rumoured that Larry Page and Sergey Brin's start up of Google was financed by credit cards to buy the necessary computers and office equipment, more specifically "a terabyte of hard disks". Similarly, filmmaker Robert Townsend financed part of Hollywood Shuffle using credit cards. Director Kevin Smith funded Clerks in part by maxing out several credit cards. Actor Richard Hatch also financed his production of Battlestar Galactica: The Second Coming partly through his credit cards. Famed hedge fund manager Bruce Kovner began his career (and, later on, his firm Caxton Associates) in financial markets by borrowing from his credit card. UK entrepreneur James Caan (as seen on Dragon's Den) financed his first business using several credit cards. ^ Sullivan, arthur; Steven M. Sheffrin (2003). Economics: Principles in action. Upper Saddle River, New Jersey 07458: Pearson Prentice Hall. pp. 261. ISBN 0-13-063085-3. http://www.pearsonschool.com/index.cfm?locator=PSZ3R9&PMDbSiteId=2781&PMDbSolutionId=6724&PMDbCategoryId=&PMDbProgramId=12881&level=4. ^ a b Martin, Andrew (January 4, 2010). "How Visa, Using Card Fees, Dominates a Market". New York Times. http://www.nytimes.com/2010/01/05/your-money/credit-and-debit-cards/05visa.html?em=&pagewanted=all. Retrieved 2010-01-06. "The fees, roughly 1 to 3 percent of each purchase, are forwarded to the cardholder’s bank to cover costs and promote the issuance of more Visa cards." ^ a b c Dickler, Jessica (2008-07-31). "Hidden credit card fees are costing you". CNN. http://money.cnn.com/2008/07/28/news/credit_card_interchange/. Retrieved 2010-04-30. ^ a b c d "Credit Cards and You - About Pre-paid Cards". Financial Consumer Agency of Canada. Archived from the original on 2007-03-07. http://web.archive.org/web/20070307084013/http://www.fcac-acfc.gc.ca/eng/publications/CreditCardsYou/PrepaidCards_e.asp. Retrieved 2008-01-09. document: "Pre-paid Cards" (pdf). Financial Consumer Agency of Canada. Archived from the original on 2008-02-29. http://web.archive.org/web/20080229122947/http://www.fcac-acfc.gc.ca/eng/publications/CreditCardsYou/PDFs/Prepaid-e.pdf. Retrieved 2008-01-09. ^ United States Securities and Exchange Commission FORM S-1, November 9, 2007. ^ Debit Cards Cash In On Rewards Riches Tampa Tribune, Feb. 15, 2008. ^ Gracia, Mike (2008-05-09). "credit cards abroad". creditchoices.co.uk. http://www.creditchoices.co.uk/credit-card-charges-abroad.html. Retrieved 2008-05-09. ^ "Plastic cards in the UK and how we used them in 2007"
This page was last modified on 6 June 2011 at 20:18.